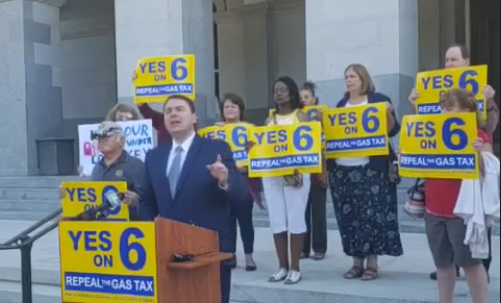 Leaders of the Yes on Prop 6 Gas Tax Repeal Campaign revealed a bold plan to fix California’s roads and improve infrastructure – all without a tax hike – and officially filed a statewide Ballot Measure to amend the state Constitution. Efficiency Reforms and Audits: The initiative will require annual performance and efficiency audits on road repair and infrastructure projects. Instead of audits being selected by politicians or bureaucrats, citizens will be able to nominate the specific projects to be audited. Terminate the High Speed Rail Project: The initiative will direct the Governor to terminate all activity on the High Speed Rail project and use any unspent funds on other transportation needs. Local Control of Funds: The initiative shifts authority and decision-making on gas tax and car sales tax funds to city and county governments to spend on projects they deem worthy. The Yes on Prop 6 campaign released the full text of the ballot measure and a comprehensive fiscal assessment comparing current vs. proposed road and infrastructure funding streams under the measure. The filing of this ballot measure is Phase 3 of the citizen-led revolt against the gas and car tax hikes that politicians have enacted. Assuming voters approve Prop 6 – the Gas Tax Repeal, the Yes on 6 campaign will immediately initiate signature collection by December 1.